University of Notre Dame faculty Ebrahim Moosa, professor of Islamic studies, and Mahan Mirza, professor of the practice, will lead 45 madrasa students in Doha, Qatar, Dec. 25 (Monday) on a seven-day exploration of the tensions and harmonies between traditional Islamic thought and the scientific and technological advances of modernity. Moosa and Mirza are both faculty in the new Keough School of Global Affairs. Madrasas are the most common Muslim educational institutions, and the Madrasa Discourses project, part of the Contending Modernities initiative, is funded by a three-year grant from the John Templeton Foundation. The project aims to enhance scientific and theological literacy among recent graduates of South Asian madrasas. Students from India and Pakistan are invited to consider new ways to balance fidelity to ancient moral teachings with new knowledge. By autumn of 2018, Madrasa Discourses will launch a new educational platform to make its digital resources accessible to a global audience — with the goal of enhancing Muslim theological literacy and furthering the conversation about theology and science in Islam. The winter intensive in Qatar is the second Madrasa Discourses gathering and will be hosted by the College of Islamic Studies at the Hamad bin Khalifa University. The first gathering was in Kathmandu during summer 2017. New students and previous participants alike will convene for the winter intensive in Doha. A guided series of readings aims to enliven discussion on theology, ethics, policy and citizenship in a pluralistic global society. A primary focus of the week will be showing how literalist interpretations of sacred texts can distract and obscure timeless moral truths. Participants will be given an opportunity to explore how best to translate these theological and moral truths as part of the common good, the advancement of human dignity and human development. 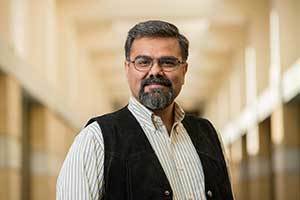 According to Mirza, the rewards of the project come when students see the reasonableness and intelligibility of science and alternative theological perspectives. Originally published by Amanda Skofstad at news.nd.edu on December 19, 2017.